Samsung just announced that the gold version of its Galaxy S5 flagship smartphone will be released in the US on May 30. Starting that day, you’ll be able to grab a golden S5 from AT&T, Sprint, T-Mobile, U.S. Cellular, and Verizon. Apparently, the Verizon variant will be available only “through select indirect retailers”, so you might not find it in Verizon stores. The gold Samsung Galaxy S5 should have the same price as the black and white versions that are already available to purchase: $199.99 on contract. Naturally, its features are unchanged, including Android 4.4 KitKat, a 5.1-inch 1080p Super AMOLED display, fingerprint recognition sensor, heart rate monitor, 16MP rear camera, quad-core Snapdragon 801 processor, and a 2,800 mAh battery. According to Samsung, the golden Galaxy S5 could make a “perfect gift” for new graduates, or for “the fashionable dad who wants to add a little swagger to his wardrobe” (since Father’s Day is coming up in mid-June). 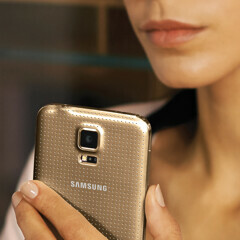 Well, if the gold S5 is for you, or for anyone close, now you know that it's coming soon. For an in-depth look at this smartphone (black version), check out our Samsung Galaxy S5 review here. It's basically a comfort phone for chavs. O lo'd! Dat gon look da shi wit ma grill dog!!! Dat SammieFive be blazin, givin me a bone. All da talent be buzzin on the SammieFive. Gonna git me a Sammie and get chuffed. Me and the homeez gonna diss that ZedTwo, phone for dobbers, mingers, and knob jockeys. You and your retarded friends will not stop people from buying this phone so yeh!! Iph5 made from glass very fragile. Don't like anything made of gold. Cheap junk plastic gold low quality Unlike Ip5s and HTC one M7 using aluminium gold? And where did you "feel" the quality of the Find7? Hey guys, is it really happened that the article about "LG G3 poster photographed in the wild, confirms Snapdragon 801 is under the hood" is deleted from this site? I'm still seeing that on the PA's front page. I already got the gold and blue battery doors from ebay, they look great imo. The funny thing is that I much prefer their version of gold to the others..